Hard Rock Café – All Tickets Inc.
America loves rock and roll and America loves the Hard Rock Café. This truly special rockthemed restaurant has a diverse group menu that will please both hearty meat eaters and dedicated vegetarians. Tender veggie burgers, creamy Caesar salads, and flavorful pulled pork are all available. For groups that desire a big dinner, there’s the Hard Rock’s ½ Rack of BBQ Ribs with French fries, coleslaw, or BBQ baked beans. The restaurant’s Grilled Hawaiian Chicken with mashed potatoes and fresh vegetables is an exceptional creation. Along with group lunch and dinner menus, the restaurant also offers breakfast. Of course, you’re going to love the rock theme that permeates this American restaurant. 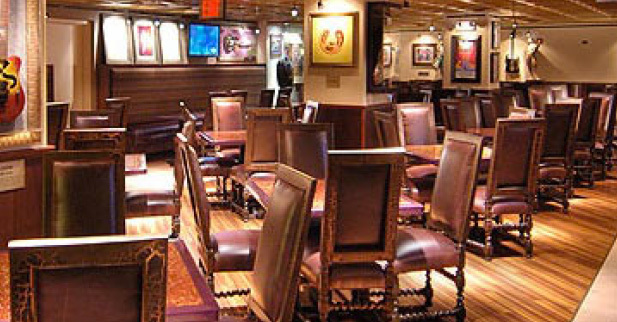 Rich in memories and memorabilia, the Hard Rock Café is a real audience pleaser. A visit to the Hard Rock Café is more than a fun dining experience; it’s a front seat tour of our country’s pop music history. Make it casual and light at the Hard Rock Café.